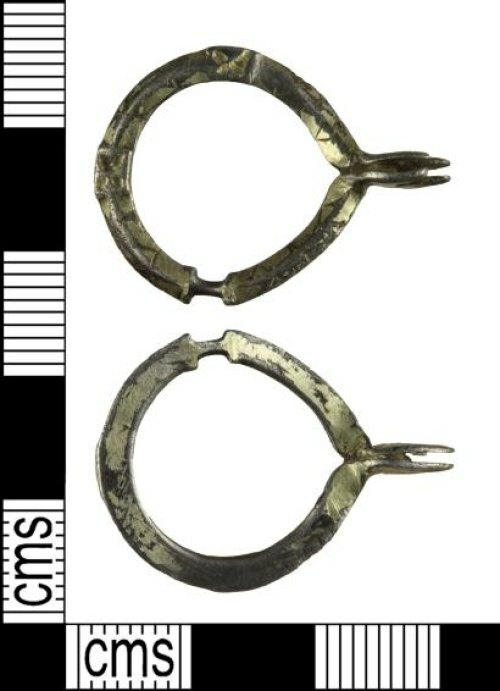 A medieval silver annular brooch dating to the period AD 1200 - 1400. The brooch has a projection in the form of a pair of praying hands. The frame has a low triangular section. The frame has a recessed bar for the missing pin, and two flat platforms each with a raised saltire. VI has been scratched into the surface of the frame in varying arrangements, this is post production and therefore perhaps a personal inscription. A good comparison and similar artefact is SUR-7A5C46, found in Codford, Wiltshire. This object contains more than 10% precious metal and is over 300 years old. Consequently, in terms of age and precious metal content, the object qualifies as potential Treasure under the stipulations of the Treasure Act 1996.